A 12 by 20 inch farm sign with the farm logo. Sign is red oak with a 3-D design. 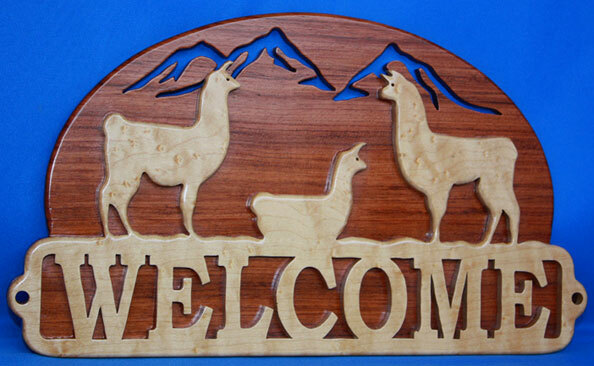 A new and different welcome sign with 3 female llamas. It measures 12" wide and 7" tall. 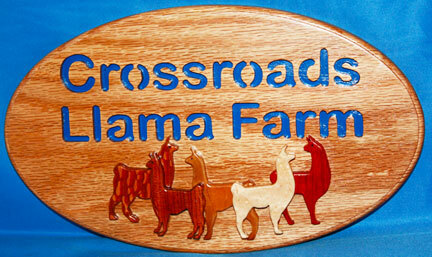 This 3-D farm sign is in red oak and features 5 llamas in exotic woods. A large farm sign with lots of critters. This sign is a double sided sign designed to be hung in the isle in front of a stall. 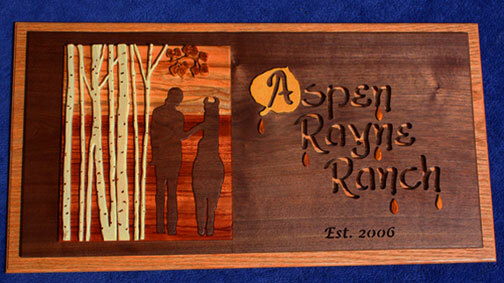 Business card holder to complement the ranch sign. An elegant 3D farm sign that makes a simple but effective statement. 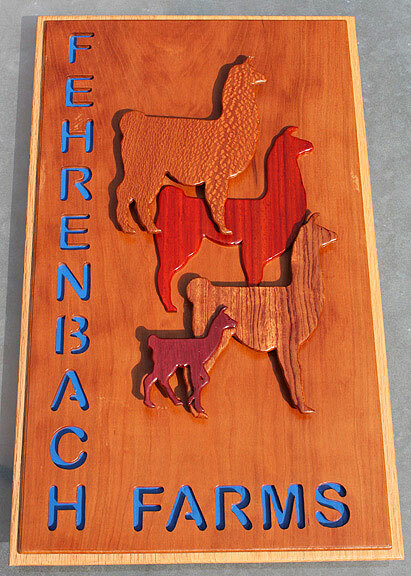 This farm display sign is 8 x 14" in Red Oak with colorful cutouts. This is now being used as their farm logo. This farm sign is red oak with the state of Virginia being a Bubinga inlay and the llama a Zebra wood 3-D raised overlay. The sign ended up being 14" by 29" in size and 1 1/2"deep. 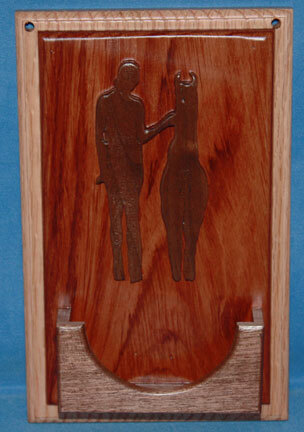 This llama farm sign/sculpture is an original and is hand crafted. The body is made from a single piece of Red Oak while the overlay is Cherry. The fifteen llamas are all patterned after llamas that were owned by the Kauffmans at Timberwind Llamas. They are crafted from the following 9 different woods, most of which are exotic wood from Africa or South America. The woods are Purple Heart, Leopard Wood, Wenge Wood, Zebra Wood, Padauk, Black Walnut, Bubinga, Birdseye Maple, and Blood Wood. This Asgaard farm sign was fun to make and has a real 3-D look that the picture doesn’t show. The red oak is 16x24 inches in size with a blue letter background. 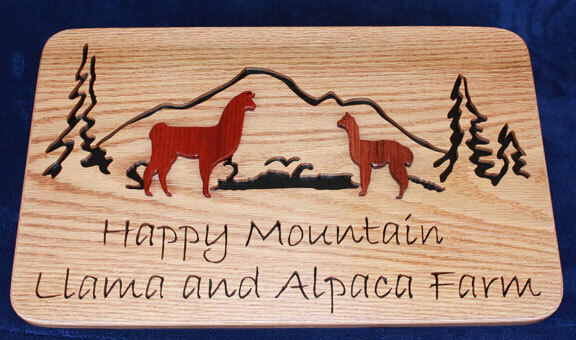 The zebrawood llama is actually three pieces that are inlayed but raised 1/8 of an inch. The seams between the different fiber directions are a rounded relief to prove a windblown look. The four piece horned helmet is an overlay over the cherry “A” inlay.